Has this ever happened to you – you have the big holiday meal planned down to the dessert, and then your Aunt Bea calls to let you know that your Cousin Lynn is now a strict vegetarian and is rather upset when she has to eat around the edges of meat-based meals. Now what do you do? Your Passover dinner focuses on brisket or lamb; your planned Easter dinner has a ham centerpiece. This Moroccan Vegetable Stew is a meal centerpiece in itself. I created it from a combination of similar stews when the caterer for our congregation’s community Passover seder needed to come up with a main dish to serve alongside the roast chicken. We needed a dish to meet both the needs of our several vegetarians, plus the rules of Passover, which in our congregation means no flour, naturally (and thus no pasta), no mixing of milk and meat on the table, and no beans or grains. It also had to be capable of being made ahead, and not too difficult to prepare. A tall order! 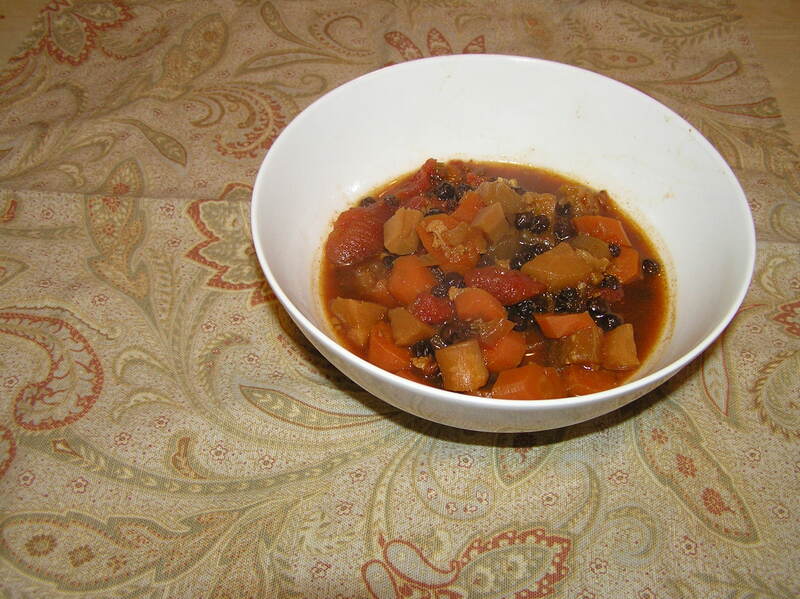 The beauty of this stew is that it meets all the criteria and is absolutely delicious. 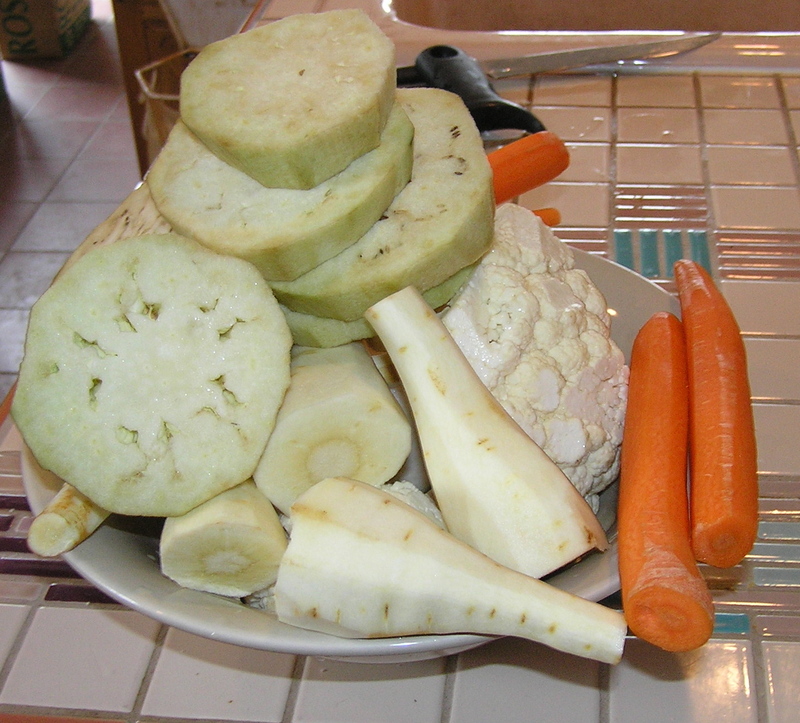 You can also improvise a bit on the vegetables and use what you have at hand, although I recommend keeping the carrots and eggplant. I have substituted green beans, zucchini, and squash for the parsnips with great results. The trick is to cut all the vegetables to about the same size. It cooks in the slow cooker, so it is no fuss. The stew is mysteriously sweet, given that it has no added sugar, and has a little kick to it because of the cayenne pepper. If you want to have a bit less kick, reduce the amount of pepper. You can serve it over couscous (but not for Passover) or rice, or serve sour cream or yogurt with it to dollop on top (no, not for Passover). I made a big cooker full this morning before I went out for a meeting. When I came home late in the evening, the house smelled sweet and spicy. The weather had turned to a cold rain, but I had a big bowl of this stew to warm me. So go out, get some vegetables, throw them in the slow cooker, and by the time Cousin Lynn shows up she’ll think you slaved all day to make a special dish for her. But don’t be surprised if all the other relatives polish off bowls of it – at our community seder it is almost more popular than the chicken. Pour olive oil into a small frying pan over medium-low heat. Add garlic and spices and cook, stirring often until fragrant, 1 to 2 minutes, being careful not to scorch the garlic. Set aside. Add broth, carrots, eggplant, parsnips, cauliflower, onion, stewed tomatoes (with juices), currants, salt, and the garlic spice mixture to a slow cooker (at least 5 quart) and stir to combine. I mixed a bit of the broth into the spice mixture so I could scrape every bit of it out of the pan. Cover slow-cooker and cook on high until vegetables are tender to bite and flavors are blended, 8 to 9 hours. Makes 6 servings (more as a side dish) at about 3 grams of fat/serving. I confess that when I first tasted it, I didn’t really like it. But I added some ground sea salt, and that perked up the flavor. The original recipe came from Cooking Light. If I make it again, I might put in more pepper and vinegar. I ate this for dinner with a side of sliced tomatoes and a couple of slices of olive bread and a Laughing Cow cheese wedge. Place eggplant, cut sides down, in a baking pan coated with cooking spray; add garlic. Bake at 450° for 30 minutes or until eggplant is tender; cool. 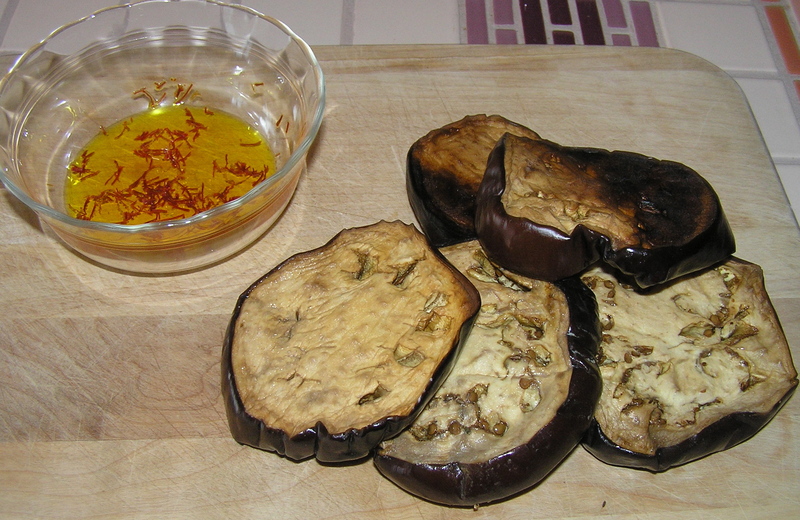 Scrape pulp from eggplant skins; discard skins. Squeeze cloves to extract garlic pulp; discard skins. Heat oil in a medium saucepan over medium heat. Add coriander, cumin, onion, and pepper; cook 5 minutes or until onion is tender, stirring frequently. Add flour; cook 2 minutes, stirring constantly. Add water and vegetable broth, scraping pan to loosen browned bits. Cool 5 minutes. Combine eggplant pulp, garlic pulp, and broth mixture in a blender, and process until smooth. Return the pureed mixture to pan. Bring to a simmer over medium-high heat, and cook 3 minutes, stirring frequently. Stir in balsamic vinegar and salt. Ladle soup into 2 bowls. Top each serving with 1 tablespoon yogurt or sour cream. Makes 2 servings with about 6 grams of fat/serving. 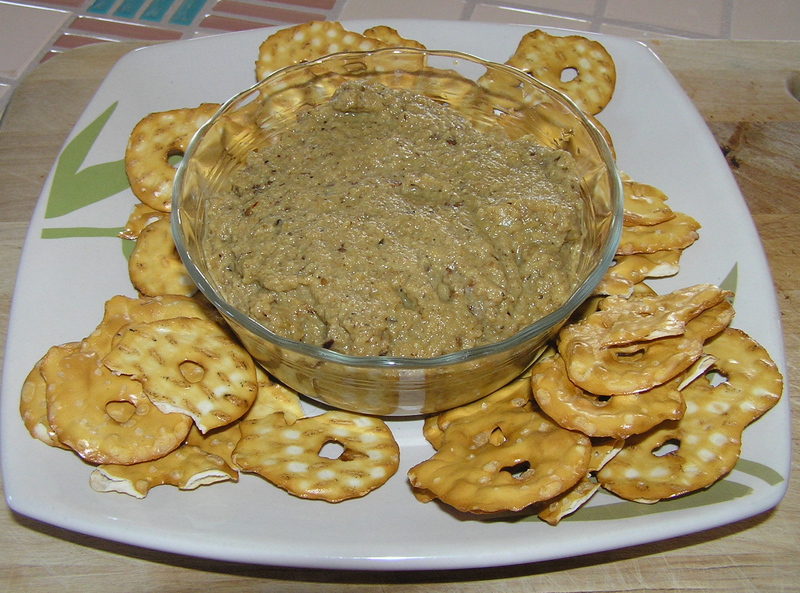 This dip uses the smoked eggplant I made earlier. It is somewhat Persian in origin, and uses flavors that are often found in Persian dishes – garlic, yogurt, mint, and saffron. This dip is a bit tart, and probably goes better with crackers or pita chips than with raw vegetables. I have also used it as a spread on a sandwich. Soak saffron in 1 tablespoon of hot water for 10 minutes. Set aside. Place all remaining ingredients in the food processor and process until smooth, scraping down bowl once. Strain saffron water into mixture and pulse until blended. This has about 1/2 gram of fat in 2 tablespoons of dip. Variation: I have also made this with 1/2 teaspoon of ground cumin, instead of the mint, and it was very tasty.